The ThreeZones shows time and session with color rectangles of 3 timezones. (Extension of my ThreeClocksMT5). The ThreeZones has 3 labels in left top of the chart. Label1 is left, label2 is center, label3 is right, respectively. And in the default settings, label1 is JST(UTC+8), label2 is GMT (UTC+0, use DST), label3 is New York Time (UTC-5, use DST), respectively. There are buttons in each left of labels that toggle show/hide the session with color rectangle. 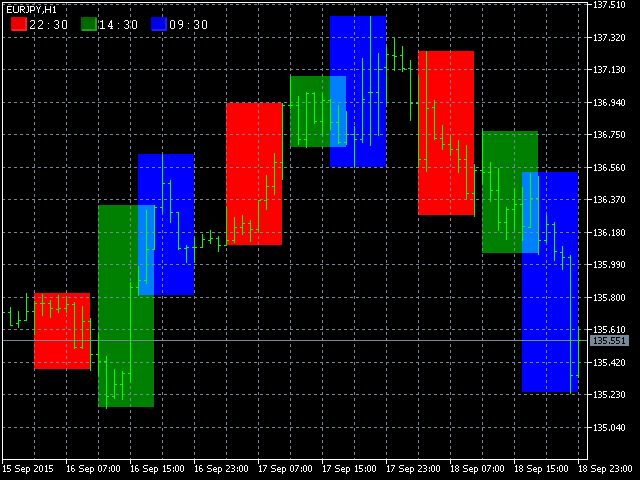 The color rectangle consists of open time, close time, high price, and low price in the session of the time zone. Note that the function of viewing sessions is available on timeframes H1 or less. GMTOffset1 — GMT offset of left label. UseDST1 — Use DST of left label. GMTOffset2 — GMT offset of center label. UseDST2 — Use DST of center label. GMTOffset3 — GMT offset of right label. UseDST3 — Use DST of right label. ServerOffset — Offset of MT4 server. If you don't know this parameter, please tell your broker. UseDSTInServer — MT4 server Time use DST or not. Zone1Color — Session color of time zone 1. Zone2Color — Session color of time zone 2. Zone3Color — Session color of time zone 3. Works great just wish I could remove zone 3 for example without having a color show up other than that its perfect love it thank you.